I spent the first day of 2019 soaring between the peaks of the Grand Tetons. It was about three o’clock in the afternoon when Lanny and I rolled out from the steel hangar in Driggs, Idaho. The plane, a six-seater Beechcraft Bonanza with ruby stripes running up and down its white casing, rumbled over the icy taxiway with the propeller beating tirelessly as it worked to warm the engine in the winter air that has fallen well below zero. Lanny, a wizened mountain guide, a climber, a photographer, and my personal pilot for the day, handed me the classic aviation headset and had me go over the pre-flight checklist with him as he took us towards the runway. After the list was completed and Lanny reported to the Tower that we were going to be taking off, the Bonanza leapt forward with a zeal as it gathered speed and eventually lifted its wheels from the earth. We shot into the air and were soon peering down onto the valley and the expanse of town below us. Lanny brought us around to the right, and through the clouds that covered the hills below us, the spire of the Grand poked violently through and came closer and closer as we made our way towards it. Going into our day, we weren’t exactly certain if we were going to be able to get close enough to the mountain range to get the opportunity to shoot some photos. The clouds had been tricky all weekend, and since we had gotten a late start to the day already, it was about a 50/50 gamble that we would get the views we were hunting for. I had my camera bag ready at my feet, and I was holding my beloved film camera expectantly as we neared the crest of the range and got ready to head into the clouds. I wish I had a video of my face when we finally got close enough to see through the cloud coverage and the Grand came into full view. It was almost as if it had been waiting for us to arrive--in an instant, the clouds thinned, and we circled the massive walls of the mountains as small and silent as a bird. My jaw hung open at the sight of the textured faces of these incredible peaks that looked like they were formed from the same storytelling as The Lord Of The Rings, and I lifted my camera over and over and over again, filling up an empty card with every single angle I could possibly hope to get of the wonder that was before me. Lanny took us close by the face of Mount Moran, a part of the range where the easiest way up is still ranked as a class 5.4 trek, and I watched as the wind blew thin lines of snow from the tallest points on its jagged face in an ethereal and almost premeditated manner. When we came back around the Grand on the eastern side, the sun began to slowly crawl below the fleeting cloud coverage which flooded the mountain with a wash of purple, orange, and red. 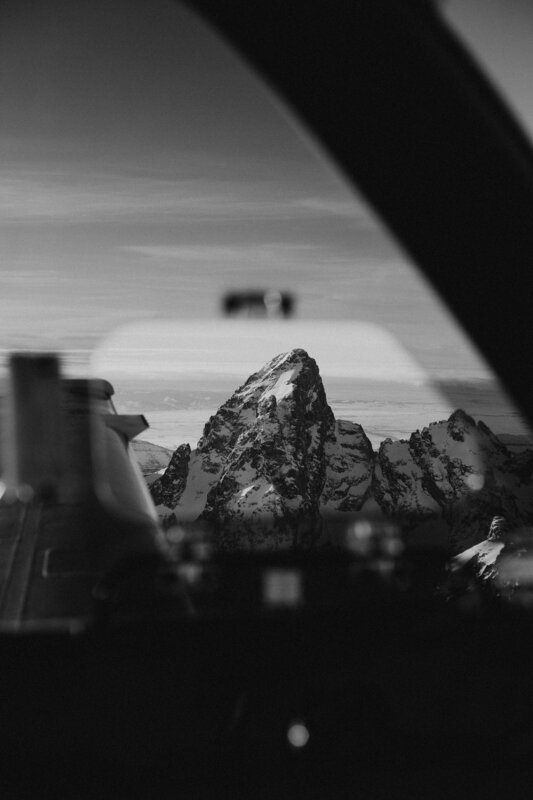 The wings shuddered against the push and pull of the colliding winds surrounding us, and the plane jostled up and down a few times, but nevertheless, the aircraft remained steady and took us into the mountains with speed and precision. I will admit, up in that freaking plane, I felt like I was on the set of an Indiana Jones movie, and the thrill of the adventure was just so present as Lanny and laughed for no reason at the other-worldly view we passed again and again. When Lanny would open the pilot’s window to allow for clearer shots, I would feel the rush of wind enter the Bonanza with a chill that had me shivering within seconds. I hardly minded the cold, however, because whenever Lanny pulled that latch and the air rushed in, I would look at those mountains--seemingly within arms reach--and I would feel this peace I can’t really describe with justice. There’s something surreal about looking at hills that are as old as the earth and feeling so small when you are near enough to be at their mercy. It was almost out of respect that I would lower my camera every 20 shots or so just so that I could stare in awe at do nothing else but be present when face to face with them. We took pictures until our shutter buttons froze up, and we did four more spirals around the range until the silhouette of the peaks began to grow misty with snow once more. Lanny took us down into the valley again, and we laughed at how someone was looking out for us, because we could not have asked for more perfect conditions than what we received when we were up there. The sunset guided us down through the shroud of fog that had manifested over the small town of Driggs, and it wasn’t until we were back on the taxiway that I felt like I could let go of a breath I’d been holding the whole time; maybe nerves, maybe joy, maybe excitement, maybe uncertainty. Looking at the photos from January 1, 2019, I feel very humbled. I moved to Jackson Hole, WY with no job, no plan, no connections, and no idea what was next. 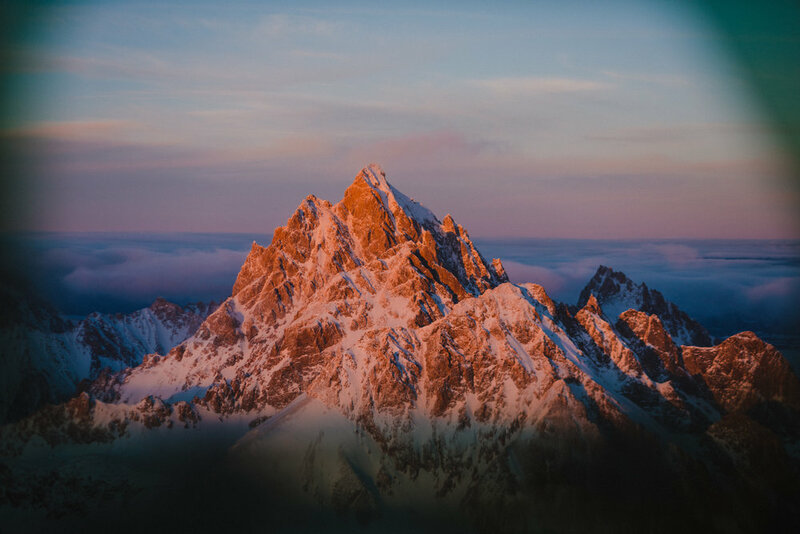 I had come to the west carrying a feeling of failure and dissatisfaction with my photography as a whole, and up until that day soaring high above the Grand Teton National Park, I was considering throwing in the towel on it entirely. It may sound silly to some, but I think those mountains gave me the bravery to not quit. Seeing those peaks in all their glory, and being given the chance to capture them on a beautiful day in my own style and in my own time, was a gift I can’t quite ever say thank you enough for. I may never know what’s next, but there will always be mountains to yearn for. And for that, I am grateful. Sarah DeMarco is a talented photographer and exceptional wordsmith. Visit her on INSTAGRAM or visit her site here.